The monthly effective interest rate. For example, the periodic rate on a credit card with an 18% annual percentage rate is 1.5% per month. Interest rate is the percentage of the face value of a bond or the balance in a deposit account that you receive as income on your investment. If you multiply the interest rate by the face value or balance, you find the annual amount you receive. For example, if you buy a bond with a face value of $1,000 with a 6% interest rate, you'll receive $60 a year. Similarly, the percentage of principal you pay for the use of borrowed money is the loan's interest rate. If there are no other costs associated with borrowing the money, the interest rate is the same as the annual percentage rate (APR). Fig. 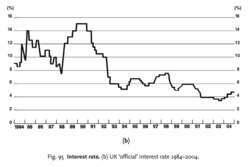 47 UK ‘official’ interest rate 1984-2004. The particular amount of INTEREST which a borrower is required to pay to a lender for borrowing a particular sum of money to finance spending on consumption and the purchase of capital assets. The rate of interest charged for any particular transaction will depend on such considerations as the purpose and duration of the loan, the amount of money borrowed, the COLLATERAL SECURITY offered (if any) and the creditworthiness of the borrower, all factors influencing the degree of perceived risk involved in making the loan as seen by the lender. base rate: the ‘floor’ rate of interest which is used by the commercial banks as the basis for charging interest on loans and overdrafts to their customers. Typically, banks would charge an interest rate only slightly above base rate to large established business customers whose risks of default are small, and administrative charges low; whereas they would charge a rate much higher than base rate to, for example, a small new business. These rates of interest (and others) are highly interrelated. The level of interest rates is determined by the forces of supply and demand for finance in the MONEY MARKET, subject to manipulation by the Bank of England as part of its application of MONETARY POLICY. Formerly, base rates etc. were linked directly to bank rate, and then its replacement the ‘minimum lending rate’, both of which were set by the government. In 1984 the minimum lending rate was abolished and from then until 1997 the government relied more on market forces to detemine interest rate levels although it did continue to ‘massage’ interest rates by OPEN MARKET OPERATIONS, buying or selling monetary instruments such as Treasury Bills (see REPO RATE OF INTEREST), and on occasions it intervened more aggressively to impose a particular level of interest rates on the economy. For example, the government set interest rates at 15% in late 1989 to head off an inflationary crisis and on 16 September 1992 interest rates were increased from 10% to 15% in a single day in a failed attempt to keep the pound in the ‘exchange rate mechanism’ of the EUROPEAN MONETARY SYSTEM. On May 6th 1997, in an unprecedented move, the government handed over the power to set interest rates to the Bank of England's MONETARY POLICY COMMITTEE whose main remit is to set interest rates so as to meet the government's ‘target’ rate of INFLATION (CPI) of no more than 2% per annum. Fig. 47 shows UK ‘official’ short-term interest rates for the period since 1964 (currently, as at March 2005,4.75%). See EUROPEAN CENTRAL BANK. The rate of interest or COST OF CAPITAL is an important factor in relation to companies' investment decisions. See INVESTMENT APPRAISAL. 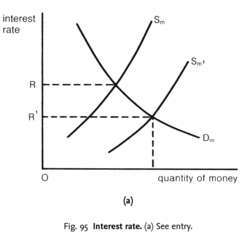 In a situation of INFLATION where prices are rising rapidly, it is important to distinguish between the ‘nominal’ interest rate stipulated in a LOAN contract and the ‘real’ rate of interest which allows for the effects of inflation in reducing the REAL VALUE or PURCHASING POWER of the interest received. See APR, LIBOR, DISCOUNT RATE, SWAP. Fig. 95 Interest rate. 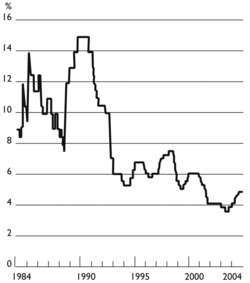 (b) UK ‘official’ interest rate 1984–2004. The particular amount of INTEREST that a household or business borrower is required to pay to a lender for borrowing a particular sum of money to finance spending on CONSUMPTION and INVESTMENT. There is some controversy about the interest sensitivity of the demand for money and supply of money schedules. Keynesians (see KEYNESIAN ECONOMICS) would argue that saving is largely a function of the level of income rather than the rate of interest so that the supply of loanable funds is relatively interest-inelastic. Keynesians also argue that investment plans are primarily determined by businessmen's expectations about future levels of economic activity, with the cost of capital being of secondary importance, so that the demand for loanable funds is also relatively interest-inelastic. This means that even quite large changes in interest rates are unlikely to have much effect upon the amounts of money demanded and supplied, and thus upon levels of consumer and investment spending. By contrast, monetarists (see MONETARISM) would argue that both the supply of, and demand for, (a) loanable funds are relatively interest-elastic so that only small changes in interest rates can have a large effect on consumer and investment spending. A number of key short-term interest rates may be identified in the UK, including the INTERBANK CLEARING INTEREST RATE (at which the COMMERCIAL BANKS lend short-term sterling funds to one another); BILL-DISCOUNTING INTEREST RATE (at which the CENTRAL BANK (BANK OF ENGLAND) is prepared to lend money to the DISCOUNT HOUSES in its capacity as ‘lender of last resort’); BASE RATE (the ‘floor’ rate, which is used by the commercial banks as the basis for charging interest on loans and overdrafts to their customers). These rates of interest (and others) are highly interrelated and subject to manipulation by the Bank of England as part of its application of MONETARY POLICY. Formerly, base rates, etc., were linked directly to ‘BANK RATE’ and then its replacement, the ‘minimum lending rate’, both of which were set by the government. In 1984 the minimum lending rate was abolished and from then until 1997 the government relied more on market forces to determine interest-rate levels although it did continue to ‘massage’ interest rates by OPEN MARKET OPERATIONS, buying or selling monetary instruments such as Treasury bills (see REPO RATE OF INTEREST), and on occasions it intervened more aggressively to impose a particular level of interest rates on the economy. For example, the government set interest rates at 15% in late 1989 to head off an inflationary crisis, and on 16 September 1992 interest rates were increased from 10% to 15% in a single day in a failed attempt to keep the pound in the ‘exchange rate mechanism’ of the EUROPEAN MONETARY SYSTEM. In 1997, in an unprecedented move, the government handed over the power to set interest rates to the Bank of England's MONETARY POLICY COMMITTEE. The ‘official’ short-term interest rate is (as at April 2005) 4.75%. Fig. 95 (b) shows UK ‘official’ short-term interest rates for the period since 1984. The rate of interest or COST OF CAPITAL is an important factor in relation to companies’ investment decisions (see INVESTMENT APPRAISAL). The rate of interest charged for any particular transaction will depend on such considerations as the purpose and duration of the loan, the amount of money borrowed, the COLLATERAL SECURITY offered (if any) and the creditworthiness of the borrower, all factors influencing the degree of perceived ‘risk’ involved in making the loan as seen by the lender. In a situation of INFLATION, where prices are rising rapidly, it is important to distinguish between the NOMINAL INTEREST RATE stipulated in a LOAN contract and the ‘real’ or EFFECTIVE INTEREST RATE which allows for the effects of inflation in reducing the REAL VALUE or PURCHASING POWER of the interest received (see REAL INTEREST RATE). See MONEY DEMAND SCHEDULE, MONEY SUPPLY SCHEDULE, MARGINAL EFFICIENCY OF CAPITAL/INVESTMENT, APR, LIBOR, TAYLOR RULE. The cost of borrowing money, expressed as a percentage per year of the money borrowed. The rate charged the borrower each period for the loan of money,by custom quoted on an annual basis. A mortgage interest rate is a rate on a loan secured by a specific property. Calculating the Interest Due from the Interest Rate: The interest rate is used to calculate the interest payment the borrower owes the lender. Since the interest payment is calculated monthly, the rate must be divided by 12 before it is used to calculate the payment. Assume a 6% $100,000 loan. In decimals, 6% is .06 and when divided by 12 it is .005. Multiply .005 times $100,000 and you get $500 as the monthly interest due. Interest Rate Versus Total Interest Payments as Cost Measures: Some loan officers encourage borrowers to view total interest payments, rather than the interest rate, as the measure of cost they seek to minimize. This is a mistake. The lower the interest rate a borrower pays, the better off they are. Interest payments, in contrast, depend not only on the rate but also on the loan amount and the maturity. Some borrowers bamboozled by this argument pay a higher interest rate or fees for a biweekly mortgage that cuts their interest payments. But the lower interest payments on a biweekly are due to a shortening of the term, which results from making an extra monthly payment every year. See Biweekly Mortgage. Quoted Rates Versus Actual Rates: Not everybody can borrow at the rates quoted in the media, which are based on numerous favorable assumptions: that the applicant's credit is good, they have enough income to qualify, they can fully document their income and assets, they will occupy the house as their primary residence, and on and on. If a particular applicant doesn't meet all the assumptions, his or her rate will be higher. See Nichification. Determinants of Mortgage Rates: A major determinant of all interest rates is inflation. Rates paid by prime borrowers on 30-year FRMs reached 15% in 1981 when the inflation rate was unusually high (for the U.S.). In 2003, the rate was generally below 6% because the inflation rate was very low. A second factor that affects mortgage rates is the efficiency of the housing finance system. In most respects, the U.S. system is more efficient than those in most other countries. As a result, mortgage rates to prime borrowers in the U.S. are only 1%-1.5% above long-term government bond yields. In many other countries, the spread is twice as large or more. Predicting Mortgage Rates: The general level of interest rates is not predictable, but specific interest rates that lag the general market may be. Before the development of secondary mortgage markets, mortgage rates had some degree of predictability because they lagged bond yields by anywhere from two to eight months. are placed in pools against which mortgage-backed securities (MBSs) are issued. MBSs trade actively in the market and are considered close substitutes for bonds. This means that MBS yields and bond yields change together. Since lenders base their rates to borrowers on MBS yields, there is no longer a leading indicator of mortgage rates. And some analysts doubt that interest rates fluttering near 9 percent will have much impact on sales. Quite candidly, the notion that an interest rate differential is justified because "financial institutions" borrow and lend money at different rates is without merit. For some time now, I have been warning that, in today's financial environment, disintermediation from the banking system is as likely to be caused by low short-term interest rates as by high short-term interest rates. In sum, we need to restore market functions and normalize interest rates in order to reverse the current flow of income from households to companies. TIPS made the most sense as a long-term buy and hold in June when the interest rate on 10-year TIPS was about 2. Their principal does indeed fluctuate, dependent on interest rates. Here's how it works: Let's say that in addition to varying the interest rate and the term of the loan, you want to look at different loan amounts. Unless there are dramatic changes in the economy, you will see the Federal Reserve raise interest rates by another half-point at their next meeting,'' said Jack Kyser, chief economist for the Los Angeles Economic Development Corp. In these circumstances, there is no alternative to higher real interest rates diverting real resources from the private to the public sector. Clearly, if you're firmly convinced that interest rates will move a particular way during your borrowing period and you have a definite idea of whether you'll prepay your loan, then these two traditional options will meet your needs. Thank you for soliciting the views of the Tax Executives Institute concerning the determination of the appropriate interest rate under section 263A(f) of the Code. For the past few decades, every cycle of rising interest rates in the United States has brought economic contraction and widening interest rate spreads among emerging market borrowers--particularly in Latin America.